Toschi, Modena food company specializing in the production of liqueurs, fruit sottospirito, cocktails, syrups, toppings, sugar, fruit syrup, black cherry, ice cream variegated, prepared for ice cream, classic pastas, pastries, fruit jam, balsamic vinegar IGP, balsamic glaze and wine vinegar. 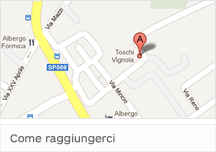 All products of Toschi brand are distributed in many countries around the world. 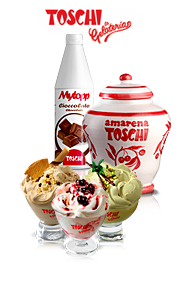 In Europe, Toschi products, including spirits, fruit sottospirito, cocktails, syrups, toppings, sugar, fruit syrup, black cherry, ice cream variegated, prepared for ice cream, classic pastas, pastries, fruit jam, balsamic vinegar, PGI, and balsamic glaze wine vinegar, are sold and distributed in the following countries: Albania, Austria, Belarus, Belgium, Bulgaria, Czech Republic, Denmark, Italy, France, Germany, Greece, Hungary, Kazakhstan, Poland, Portugal, England, Romania, Russia, Spain , Turkey, Ukraine. Oregon, Pennsylvania, Rhode Island, South Carolina, South Dakota, Tennessee, Texas, Utah, Vermont, Virginia, Washington, West Virginia, Wisconsin, Wyoming) e Canada. 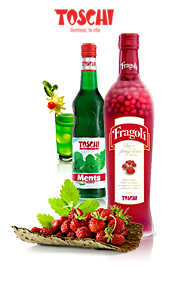 Liqueurs, fruit sottospirito, cocktails, syrups, toppings, sugar, fruit syrup, black cherry, ice cream variegated, prepared for ice cream, classic pastas, pastries, fruit jam, balsamic vinegar IGP, glaze and balsamic vinegar produced by the Toschi are also present in the following countries in South America. In particular, Toschi products are distributed in Brazil, Paraguay and Venezuela. Toschi products are also present in Asia: Cyprus, India, Japan, Kazakhstan, Philippines, Russia, Saudi Arabia, Turkey, Iran. All Toschi brand products are sold and distributed in some African countries: Egypt and Libya. 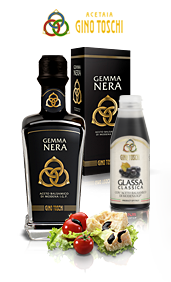 Liqueurs, fruit sottospirito, cocktails, syrups, toppings, sugar, fruit syrup, black cherry, ice cream variegated, prepared for ice cream, classic pastas, pastries, fruit jam, balsamic vinegar IGP, glaze and balsamic vinegar produced by the Toschi are also present in Australia.